A total solar eclipse occurred on August 18, 1868, also known as "The King of Siam's eclipse". A solar eclipse occurs when the Moon passes between Earth and the Sun, thereby totally or partly obscuring the image of the Sun for a viewer on Earth. A total solar eclipse occurs when the Moon's apparent diameter is larger than the Sun's, blocking all direct sunlight, turning day into darkness. Totality occurs in a narrow path across Earth's surface, with the partial solar eclipse visible over a surrounding region thousands of kilometres wide. 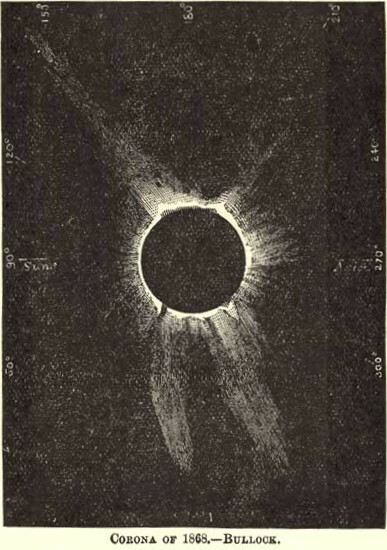 Bullock sketch of the eclipse, Total Eclipses of the Sun, 1900. M. Stephan sketches of the eclipse, Archives des missions scientifiques et littéraires, 1868. Map of the forecast path of the total eclipse, Archives des missions scientifiques et littéraires, 1868. Several expeditions were sent to observe the eclipse. One of two expeditios from Germany was sent to Aden. The expedition was led by Gustav Spörer. The second expedition was sent to the west coast of India. The expedition was led by Friedrich Tietjen. Captain Bullock observed from the Celebes sea, sketching the appearance of the corona, while Gustav Fritsch accompanied an expedition to Aden. French astronomer Pierre Janssen observed the eclipse from Guntur in Madras State, British India. It was the first total eclipse since Gustav Kirchhoff's 1859 theory that the Fraunhofer lines in the solar spectrum correspond to the emission line of the different chemical elements present in the Sun. Correspondingly, Janssen observed the eclipse with the aid of a spectroscope. He noticed a bright yellow line (λ = 587.49 nm) in the spectra of the solar prominences that could not be due to sodium as had previously been assumed, and was subsequently able to observe the same line even without the need for an eclipse. The same result was found independently by British astronomer Norman Lockyer, and both Janssen's and Lockyer's communications were presented to the French Academy of Sciences on October 26, 1868. 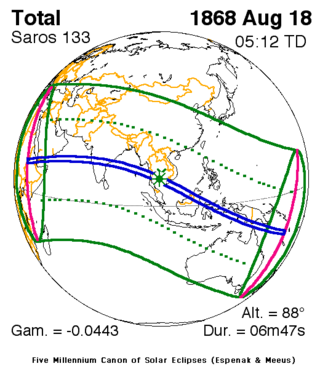 King Mongkut, also known as Rama IV of Siam, was able to calculate and predict the solar eclipse two years earlier. The calculations were correct as to the place, the time and the type of the solar eclipse that would happen. The eclipse took place precisely as the king had predicted, the total phase lasting six minutes and 46 seconds. In fact, his calculations were better — by about two seconds — than those of the French astronomers, who acknowledged his accuracy. Mongkut was exposed to malaria, then developed chills and fever. He died on October 1, 1868. According to the Thai Astronomical Society and NASA, this eclipse is known as "The King of Siam's eclipse". It is a part of solar Saros 133. ^ Gustav Spoerer (1869). 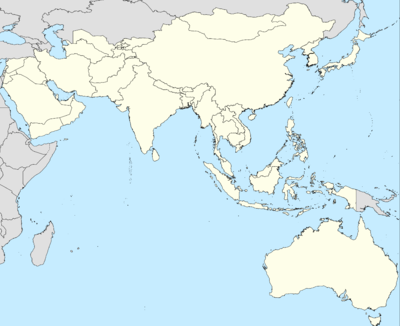 Die Reise nach Indien zur Beobachtung der totalen Sonnenfinsterniss am 18. August 1868: Vortrag gehalten in der Singakademie zu Berlin am 16. Januar 1869. Engelmann. ^ Zeitschrift. D. Reimer. 1870. pp. 608–. ^ Leggett, Hadley (August 18, 2009), Aug. 18, 1868: Helium Discovered During Total Solar Eclipse, wired.com, retrieved 2010-03-18 . ^ "Comptes rendus hebdomadaires des séances de l'Académie des sciences", C. R. Acad. Sci. Paris, 67: 836–41, 1868 . ^ Montes-Bradley, Saul M.; Bradley, W.L. (10 January 2006). "Descendants of Danyell Broadley de West Morton". Eighth Generation. Thomas Osgood Bradley Foundation. Archived from the original (964-word excerpt from Siam then, the foreign colony in Bangkok before and after Anna, Pasadena, California, 1981.) on 2013-08-09. Retrieved 9 August 2013. King Mongkut's prediction surpassed those of European scientists. "In the 19th century, King Mongkut of Siam (now Thailand), an amateur astronomer, paid the ultimate price for eclipse-chasing: his life. ^ Candey, Robert. M. (28 Sep 2009). "Solar Eclipses of Historical Interest". NASA. Retrieved 25 April 2017. Wikimedia Commons has media related to Solar eclipse of 1868 August 18.